This story was updated Aug. 4 at 12:45 p.m. to reflect Aguilar’s correct age. A second suspect has been named in the investigation of a 20-year-old Mexican national’s death. The Hidalgo County Sheriff’s Office issued an arrest warrant on Thursday for Santos Omar Vasquez, 44, in relation to the death of Carlos Mario Perez Aguilar. This is in addition to three unrelated arrest warrants previously issued for Vasquez that include assault, criminal trespass and criminal mischief, said Jena Palacios, HCSO spokeswoman. 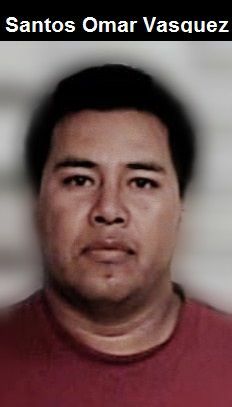 In the case of Aguilar’s death, Vasquez, who investigators believe may have fled to Mexico, is wanted for tampering or fabricating physical evidence with intent to impair a human corpse, according to a sheriff’s news release. Aguilar’s girlfriend and Vasquez’s sister, Laura Leticia Vasquez, 45, was arrested Tuesday for her role in disposing his body in a rural Donna orchard. Sheriff’s deputies located Aguilar on the morning of July 23 after a concerned citizen tipped them off. Laura Leticia Vasquez was also charged with tampering or fabricating physical evidence with intent to impair a human corpse. She remains in the Hidalgo County Adult Detention Center. According to a criminal complaint, she alleges that her brother informed her that Aguilar had committed suicide in their Alamo home and aided him in disposing of the body. Neither of the siblings reported Aguilar’s death to authorities. The results of Aguilar’s autopsy are still pending, Palacios said, and his body showed no signs of visible trauma. Little information is known at this time about Aguilar, other than that he was from the state of Veracruz. Investigators previously thought he was 17 years old, but Palacios said Friday they learned Aguilar was actually 20 years old after the Mexican Consulate in McAllen tracked down his birth certificate. Those with information that can lead to Santos Omar Vasquez’s arrest are asked to call the sheriff’s office at (956) 383-8114 or the anonymous Hidalgo County Crime Stoppers hotline at (956) 668-8447.